St. Patrick’s Day is right around the corner and we’ve been celebrating with all kinds of cute rainbow and leprechaun crafts and foods. I really love rainbows—they’re bright, colourful and magical to kids. This was a really easy snack to make and it’s jam-packed with vitamins and nutrients for little bodies. Here’s how you can make this snack at home. 1. Take your slices of bell pepper and arrange them in a rainbow pattern on your plate—red, orange, yellow and then green. 2. Grab your 2 cauliflower florets and place them on either side of your pepper rainbow. 3. In the middle of the rainbow, I placed a small silicone cup of ranch dressing for dipping. 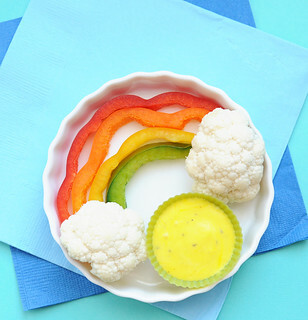 If you want to make your dressing a “pot of gold,” you can add a little yellow food colouring to the dressing. So simple, yet so beautiful. Serve this yummy snack to your kids and you’ll surely see them smile!